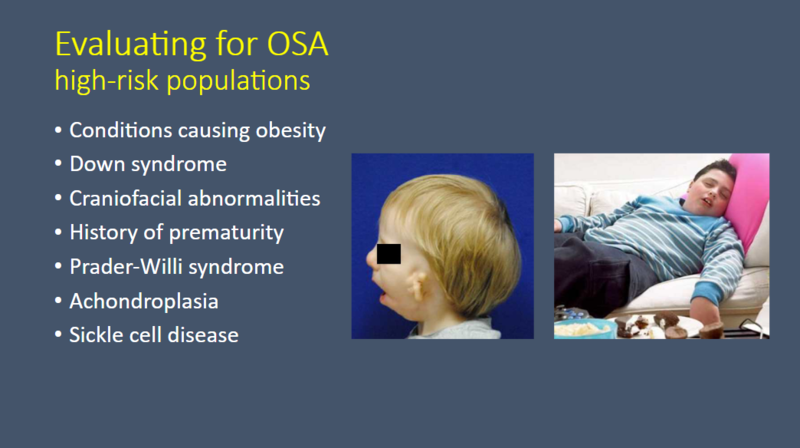 Just to give you an idea, this is what an obstructive sleep apnea actually looks like. And this is what we see when we do an in-lab polysomnogram. What we see on the top is sort of an abbreviated EEG. And then we look at many other signals. So the electromyogram (EMG) this is look at the chin tone. It helps to distinguish awake and asleep and then REM sleep. We have an ECG [channel]. . . . [And] we can use this to look for arrythmias or bradycardias which actually doesn’t happen that often [in children]. We look at airflow through two different measures. . . .
We look at chest and abdominal plethysmography to look at whether or not the chest and abdomen are moving and whether they are moving together. And then we have a lot of measures of gas exchange. So in this example, you can see the patient’s airflow very nicely here. And then they have a period where [the airflow signals] become very flat. So when they are completely flat, that is an apnea. And you can identify that it is an obstructive event because, as you can see, the patient’s chest and abdomen continue to move. So there is continued effort but there is no airflow. 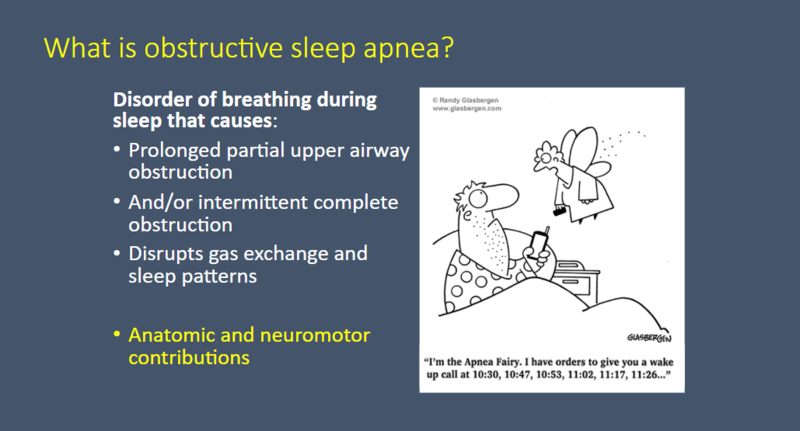 So that tells you that it is an apnea and an obstructive apnea. And then as a result of that, in this patient, their oxyhemoglobin saturation goes from 98% down to 80%. And this is only a very brief event, maybe six or seven seconds long. And these can happen, obviously, throughout the night. 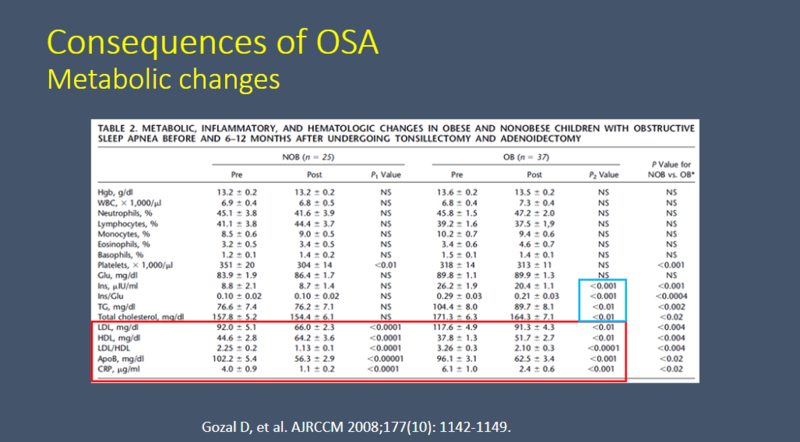 In children, those sort of end-organ consequences [meaning the list above for adults] are much more rare, thank goodness. This study is from Resource (2) below. See Resource ( ) below. 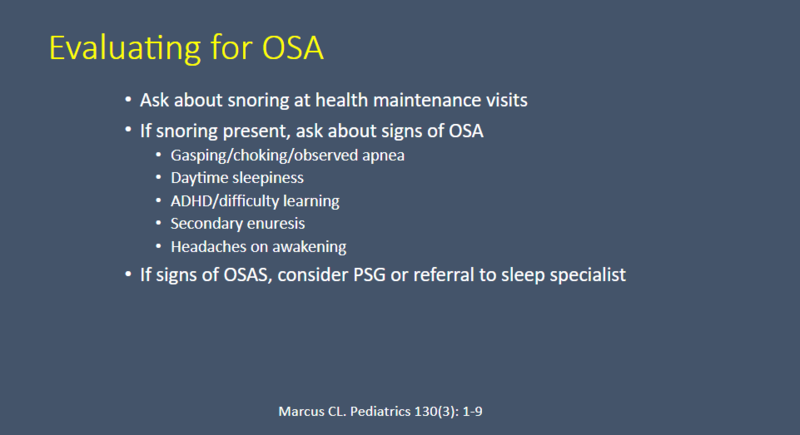 (1) Diagnosis and management of childhood obstructive sleep apnea syndrome [PubMed Abstract] [Full Text HTML] [Full Text PDF]. Pediatrics. 2012 Sep;130(3):576-84. doi: 10.1542/peds.2012-1671. Epub 2012 Aug 27. 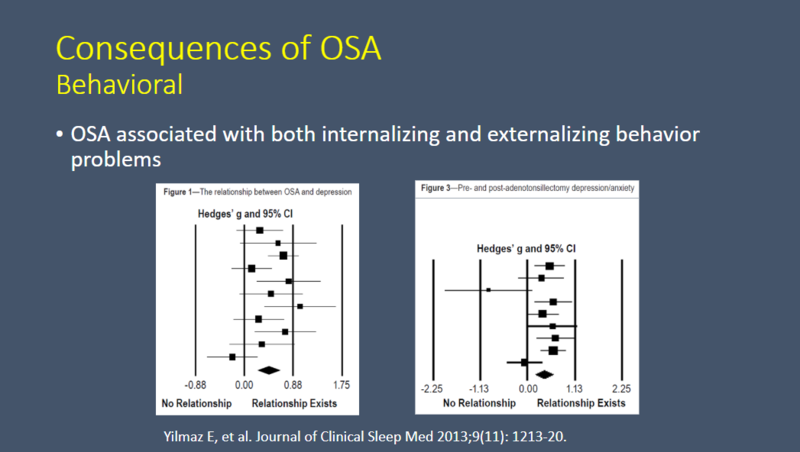 (3) The Relationship between Depressive Symptoms and Obstructive Sleep Apnea in Pediatric Populations: A Meta-Analysis [PubMed Abstract] [Full Text HTML] [Full Text PDF]. J Clin Sleep Med. 2013 Nov 15;9(11):1213-20. doi: 10.5664/jcsm.3178. 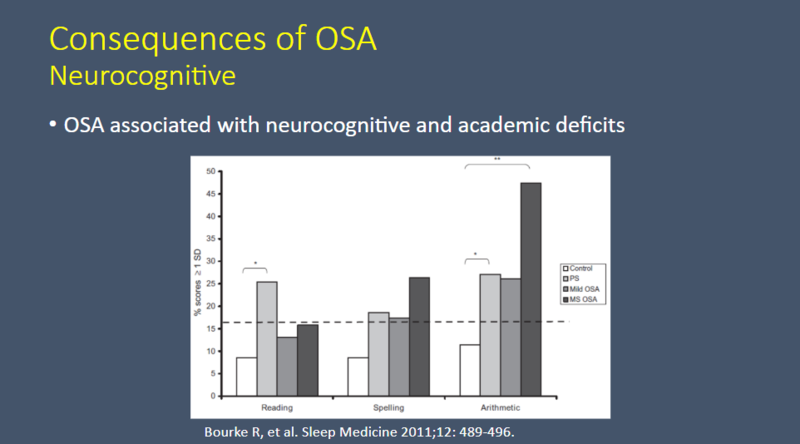 (4) Cognitive and academic functions are impaired in children with all severities of sleep-disordered breathing [PubMed Abstract]. Sleep Med. 2011 May;12(5):489-96. doi: 10.1016/j.sleep.2010.11.010. 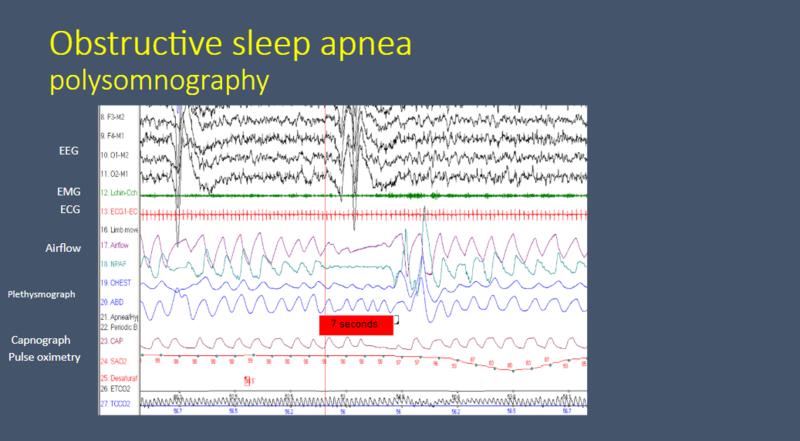 Epub 2011 Apr 13.
sleep disorders [PubMed Abstract] [Full Text PDF]. Curr Opin Pulm Med. 2007 Nov;13(6):505-9. 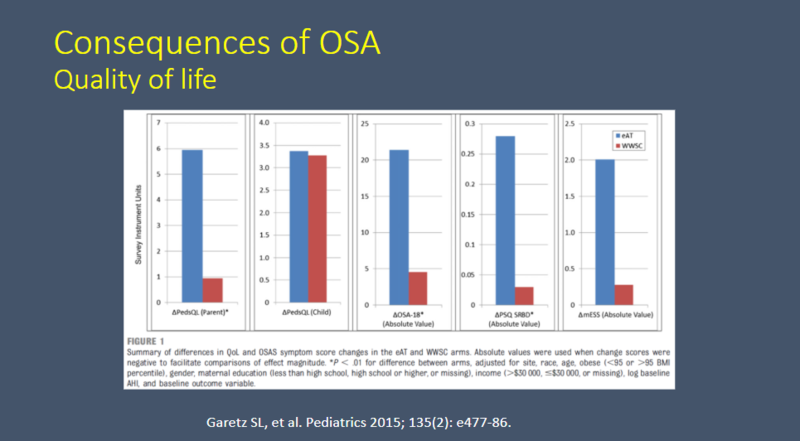 (6) Quality of life and obstructive sleep apnea symptoms after pediatric adenotonsillectomy [PubMed Abstract]. Pediatrics. 2015 Feb;135(2):e477-86. doi: 10.1542/peds.2014-0620. Epub 2015 Jan 19. 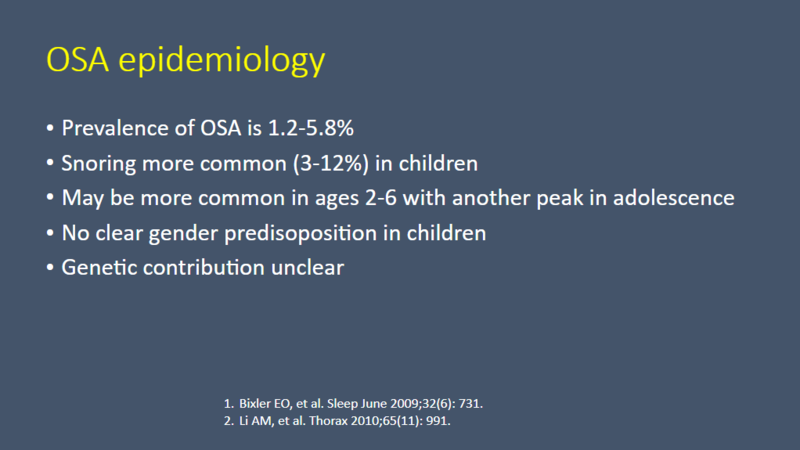 This entry was posted in CHOP, CHOP Peds Lectures, Pediatrics. Bookmark the permalink.